The Koneki project is a proposed open source incubator project under the Eclipse Technology Project. When first faced with the assignment of setting up a remote management and supervision system for devices scattered over a large geographical area, a developer faces miscellaneous and usually tricky engineering problems. Embedded application development complexity - Because it is very close to the underlying hardware, embedded development can turn out to be a complex task, especially considering the fact that people developing M2M solutions are domain experts (healthcare, smart grid, …), not necessarily software specialists. Variety of M2M embedded modules - There are many M2M-capable devices available on the market, and they all come with different operating systems (although Linux seems to become the norm), different APIs to communicate with a distant server (over HTTP, TCP, or whatever) or with a "local" asset (serial protocol, Modbus, ZigBee®, …). This fragmentation makes it very difficult to come up with reusable, portable, software. The main goal of the proposed project is to provide Machine-to-Machine solutions developers with tools easing the development, simulation, testing/debugging and deployment of such solutions. Providing tooling built on top of this application model to improve M2M development experience. As detailed in the Background paragraph, there are many flavors of M2M modules, vendor SDKs, communication protocols, etc. ; the proposed project will therefore define and expose the APIs needed to support M2M development in the large. 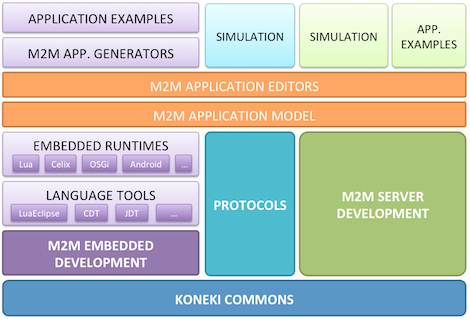 The Koneki project goal will be to deliver a first-class development environment for M2M solutions developers. Language tools — Koneki will rely on existing language development tools (CDT, JDT, DLTK-based editors, …) to give the M2M developer access to usual editing features (syntax highlighting, content assist, outlines, …). M2M application generation — Koneki will provide an extensible generation infrastructure built on top of the M2M application model. Application examples — Machine-to-Machine solution developers are not necessarily skilled embedded developers (e.g. a solution to remotely control an industrial equipment will likely be developed by a control engineer), the Koneki project will therefore focus on providing the developer with embedded application templates and examples. Koneki project will provide the user with utilities to manipulate M2M & industrial protocols: encode/decode binary frames, perform bandwidth usage simulation according to different communication scenarios, etc. Simulation — Koneki will provide extension points enabling the creation of a consistent UI on top of existing protocol simulators/emulators. Koneki will define an abstraction (a la WST Server Adapter) of what an M2M server is. It will allow M2M services providers to implement their own connector, and developers to easily configure the server-side model of their application, discover the Web Services exposed by the server, etc. Simulation — Koneki will provide a generic simulation infrastructure to allow developer to test different communication policies (and their consequences on bandwidth consumption), monitor data transfers, simulate communication failures, etc. Application examples — Koneki may package exemplary end-user applications to illustrate the use of M2M server APIs. Application model — Koneki will implement an M2M application model allowing an M2M solution developer to create an abstract definition of the capabilities of an M2M application (communication capabilities, exposed variables, communication policy, supported remote commands, …). Application editors — Koneki will provide high-level editors (forms, diagrams, DSL-based editors) of M2M application models, assisting the developer with the design of his/her embedded application. Koneki will work even more closely with eTrice (MDT project) and Yakindu (EclipseLabs project at the moment) teams to establish an M2M application/component model. In addition, an Eclipse M2M Industry Working Group will likely be created to help industrial partners and tool vendors to come up with a reference environment to develop M2M solutions. Having Koneki at eclipse.org is the best way to ensure a good collaboration between the Koneki team and the members of the Working Group in charge of identifying M2M tooling requirements. A graphical editor on top of this component model to give the developer the ability to visualize and modify its application structure, and perform type and consistency checks. No legal issues are anticipated although all 3rd party bundles used in the initial contribution, and that are not already made available via the Orbit project, will need to go through the standard Eclipse IP process. 20-Apr-2011 Detailed the functional architecture. Refined the project plan and relationships with other Eclipse projects. Added Kévin Kin-Foo to initial committers list.